The new laws will come into force on 1st Oct 2017. The new cricket law on restriction of bat thickness is on from Oct 1, 2017. It places limitation on thickness of the edges and overall dept of the bat. Edges will be limited to 40mm and overall depth of the bat will be limited to 67mm. Therefore now on it would be interesting to see how frequently boundaries (4s/6s) will be scored in limited over matches. In ODIs there are few who have the ability to score every 6 balls, and they either are openers or top order batsman. 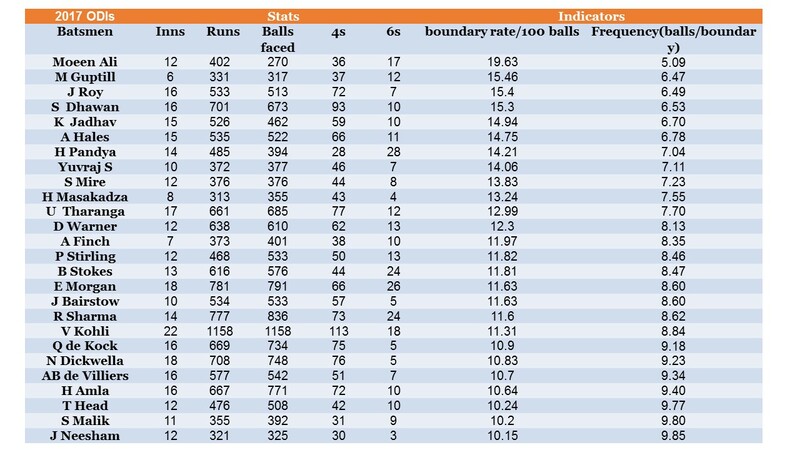 However surprisingly, and perhaps shocking for many of us to know that Moeen Ali has the highest boundary rate in ODIs this year. He scores of every 5 balls!. Must be owning a wonderful willow. Below is the list of 2017 boundary riders. Minimum qualification is 10 balls/ boundary. All data updated at the end of West Indies v England 5 match ODI series.